Water therapy has been part of traditional medicine since ancient times. Water produces a soothing, massage-like sensation on the skin that results in specific responses from the brain that help calm and soothe the body. The oldest recorded use of Hydrotherapy can be traced back to ancient Egypt, where royalty bathed in large, warm pools of water mixed with oils and flowers. Hydrotherapy came to the United States from Europe in the mid-19th century. Hydrotherapy makes use of our body’s internal and external reaction to heat, cold and pressurized water. Heat is used to sooth the body and slow down the activity of our internal organs. Cold is used to invigorate and stimulate, which increasing activity within the body. When submerged in a body of water there is a feeling of weightlessness which relieves much of the effects of gravity. In water, you weigh 10% of your actual body weight, so your body is relieved of the normal pressures exerted by gravity. This “weightlessness” alleviates pressure on joints and muscles (muscles don’t have to work as hard to keep body in position) helping to ease pain. Pulsating water creates a massage-like feeling as it gently kneads your body; air bubbles enhance the sensations on the skin and in the muscles. Adapt hydrotherapy to your practice today! 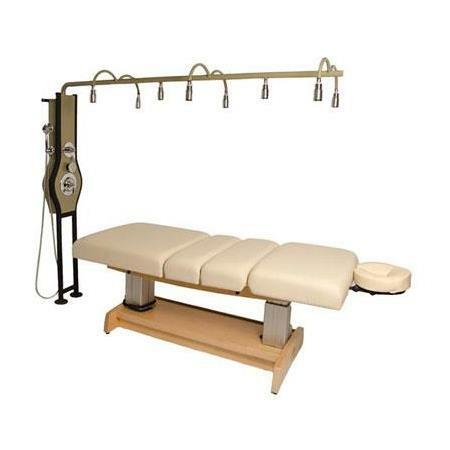 Bodyworkmall has all the supplies and equipment you need!